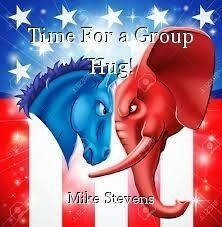 Time For a Group Hug! would like to talk to you--Nevada was a real humdinger! He'd be more than happy to book you on his show. Chair-throwing guests are his stock and trade, don't you know? Sanders' supporters shouted down all who disagreed. To the group of mostly young, don't you see where this'll lead? you're just like Spinger's guests, who mindlessly toss a chair. Come on, stop causing trouble, and it's eyes on the prize. Let's focus on defeating Mr. Big Hands, and all his disgusting lies! Don't you think it's amazing how all these people that want to govern ( or at least be part of it) resort to behaving like tantrum throwing toddlers. Didn't see the programme in question but it seems to be a pretty much universal trait. Well said, Mike. "The Jerry Springer Show" was a uniquely American T.V. show, that scraped the bottom of the for guests. High I.Q. guests, and for the most part, viewers, these people were not!